Prevention for heat stroke in children is important when the temperature rises in the summer months. As a parent, there are many things you can do to help keep your kids happy and healthy, even during a heat wave. Before heading outside, check the temperature. If the weather forecast calls for a scorcher, use your better judgment and stay indoors, where it is cooler instead. If you do not have an air conditioned home, plan a trip to a shopping mall or grocery store to keep cool. If you must go outdoors during a very warm day, start out early before the sun is at its strongest. This will enable you and your children to enjoy the outdoors much more. The sun’s UV rays are strongest between 11 a.m. and 4 p.m.*, so during those times, it’s best to stay out of the sun completely. Never leave a child unsupervised in your car, no matter what the temperature. 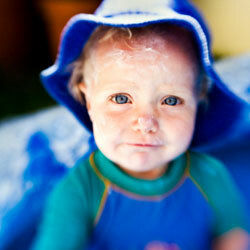 Children younger than six months cannot wear sunscreen and should stay shaded at all times. Beware – sunscreen will protect your child against harmful UV rays but not from the heat. Be attentive to your child when an outdoor activity or play date has been scheduled. Sports games are commonly held on hot summer days. Having a shaded area for children to cool down during breaks will help. Another good tip is to bring a cooler filled with water. If the weather is too hot to handle, reschedule! It’s a lot better to have an alternative indoor location for a sport than to have the team suffer from the heat. Medication  can also affect your child’s risk of heat stroke by making him or her more sensitive to the sun. If your child is prescribed medication, speak to your pediatrician and pharmacist about whether you need to take even more precautions. Taking these precautions and watching for these signs will ensure your child is kept safe and happy during the summer months.